Has Damascus Stopped Supporting Terrorists? On March 3, 2009, Secretary of State Hillary Clinton announced that she would send Jeffrey Feltman, assistant secretary of State, and Daniel Shapiro, a senior National Security Council official, to meet with Syrian president Bashar al-Assad in Damascus. The trip was the most prominent manifestation of the Obama administration's moves to reverse the Bush administration's isolation of Syria, imposed because of Syrian sponsorship of terrorism, its continued interference in Lebanon, and its support for insurgents in Iraq. 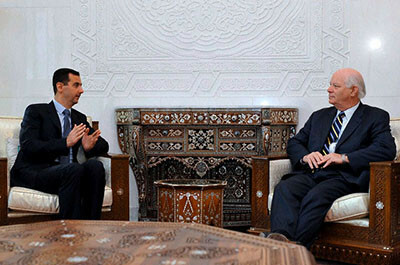 Syrian president Bashar Assad (L) meets with U.S. senator Benjamin Cardin (Dem., Md.) in Damascus, February 18, 2009. The Syrian government continues to provide critical support to the infrastructure that allows the Iraqi insurgency and Al-Qaeda to survive in the Middle East. Despite Syrian support for terrorist activities, the Obama administration has been keen to engage the regime. Diplomatic normalization may be premature, however. While the Pentagon reported in early 2008 that Damascus had decreased the flow of foreign fighters across their border into Iraq by half, Syria's contributions to the insurgency's start and survival are fact. The government of Syria continues to provide critical support to the infrastructure that allows the Iraqi insurgency and Al-Qaeda to survive in the Middle East. In the absence of real reform in Damascus, the Syrian government can reactivate or augment its networks as the U.S. military scales down its presence in Iraq. Is Syria an Al-Qaeda Enabler? The U.S. State Department has listed Syria as a state sponsor of terrorism for the past twenty years. The 2007 Country Reports on Terrorism noted that Syria provides political support to myriad Palestinian terrorist groups. Hamas, Palestinian Islamic Jihad, the Popular Front for the Liberation of Palestine, and the Popular Front for the Liberation of Palestine-General Command continue to operate offices openly in Damascus. The Syrian government provides material support to Hezbollah, the organization responsible for the deaths of more Americans in terrorist attacks than any group until Al-Qaeda struck New York City and Washington on September 11, 2001. The Syrian government long hosted—until his February 2008 assassination –Imad Mughniyah, Hezbollah's operations chief, who engineered the bombing of the U.S. Marine barracks in Beirut in 1983, the hijacking of TWA Flight 847 in 1985, and the kidnapping, torture, and execution of American hostages, including William Buckley, the CIA station chief in Lebanon. Despite the Syrian government's continued support for terrorists targeting U.S. citizens and U.S. interests—or perhaps because of it—the Obama administration has been keen to engage. In his inaugural speech, Obama declared, "To those who cling to power through corruption and deceit … we will extend a hand if you are willing to unclench your fist." Obama, after all, promised during his campaign to focus U.S. counterterrorism efforts more on Al-Qaeda. However, it is difficult to reconcile the fight against Al-Qaeda with a new embrace of Syria, given the Assad regime's array of both direct or indirect links to bin Laden's organization and its operatives. Many international Al-Qaeda plots have Syrian links. The head of the Al-Qaeda-affiliated Groupe Islamique Combattant Marocain, which claimed responsibility for the suicide bombings in Casablanca in May 2003, trained in Syria. The prosecutor in the trial of the terrorists who attacked Madrid in 2004 suspects Groupe Islamique Combattant Marocain member Hassan el-Haski of involvement in the train bombings. In May 2004, Abu Musab al-Zarqawi's lieutenants and, perhaps Zarqawi himself, held meetings on Syrian territory to plan terrorism in Iraq aimed at provoking sectarian violence. Syria harbored and refused to extradite Suleiman Khaled Darwish, Zarqawi's second-in-command and, reportedly, a liaison between Al-Qaeda and Syrian military intelligence. (He was finally killed in October 2008 in a U.S. raid on Syrian territory). Abu Faraj al-Libi, a high-level Al-Qaeda operative, met with several of his colleagues in Syria to plan terrorist attacks on the U.S., Europe, and Australia, according to testimony at his hearing. Hamid Mir, the only journalist to interview bin Laden after 9/11, explained in 2006, "Syria is a safe haven for Al-Qaeda now" even if Al-Qaeda does not trust the Syrian leadership. While Al-Qaeda can pursue its own operations, the organization must often establish symbiotic relations with states that host it. The Taliban, for example, utilized Al-Qaeda in their fight against Northern Alliance leader Ahmad Shah Massoud. Perhaps in exchange for free passage if not a safe haven in Syria, Al-Qaeda has launched attacks against states whose governments Assad distrusts, including Jordan, Lebanon, and the United States. Between May and September 2002, for example, Zarqawi set up the terrorist cell in Syria which, on October 28, 2002, gunned down U.S. diplomat Laurence Foley outside his home in Amman. Then, in March 2004, Jordanian authorities thwarted an Al-Qaeda chemical weapons attack that had been organized in and launched from Syria. Operatives linked to Zarqawi planned to attack the Intelligence Ministry, the U.S. embassy, and the Office of the Prime Minister, killing up to 80,000 people and, according to King Abdullah, decapitating the government. The Syrian government has also used its contacts in an Al-Qaeda affiliate to destabilize Lebanon. The Syrian government had long used its army's presence on Lebanese territory to exert its influence over its neighbor, but after the February 14, 2005 assassination of former Lebanese premier Rafiq Hariri, both Lebanese outrage and diplomatic pressure compelled Damascus to withdraw its troops. According to Lebanese officials, rather than allow the Lebanese government to go its own way, the Syrian regime used its ties to Al-Qaeda to assert leverage by sponsoring a radical, Sunni terrorist group, Fatah al-Islam, which established itself in Lebanon's Nahr al-Barid refugee camp. Lebanese prime minister Fouad Siniora, for example, reported to the United Nations that interrogations of captured group members showed direct contact between Fatah al-Islam and senior Syrian intelligence officials. Arab press reports suggest that the Syrian government both provided weaponry through groups under its control and used Fatah al-Islam to assassinate thirty-six individuals in Lebanon who opposed the Syrian government. Fatah al-Islam leader, Shakir al-'Absi, is a former Syrian air force officer, sentenced to death in absentia by Jordan for his involvement in the 2002 assassination of Laurence Foley. While 'Absi denies the group is part of Al-Qaeda, it is allied with Asbat al-Ansar which, according to the State Department, is an Al-Qaeda affiliate. Perhaps nowhere does the Assad regime's willingness to enable Al-Qaeda impact U.S. interests as much as in Iraq where, even after the troop surge, insurgents and terrorists continue to threaten, wound, or kill U.S. soldiers. As the U.S. administration prepared to launch Operation Iraqi Freedom in March 2003, the Syrian government was already transforming its territory into a critical lifeline for the Iraqi insurgency. While the Syrian government says they have no control over foreign fighters entering Iraq, eyewitness reports from the beginning of Operation Iraqi Freedom described how "fighters swarmed into Iraq aboard buses that Syrian border guards waved through open gates." Toward the end of 2004, Bush administration pressure led Syrian domestic intelligence services to sweep up insurgency facilitators, but many returned after just a few days. In 2004 after coalition forces recaptured Fallujah, photographs were found of Muayid Ahmad Yassin, the head of the Jaysh Muhammad insurgent group, meeting with a senior Syrian official. Coalition forces also captured a GPS system that showed waypoints in western Syria. Damascus rebuffed Riyadh's demands to shut a terrorist training camp in Syria, then hosting approximately 1,000 Saudi jihadis. Four streams of Syrian financing totaling $1.2 million per month reached insurgents in Ramadi as of 2004. Fatiq Sulayman al-Majid, a former Iraqi intelligence officer and a relative of Saddam Hussein, is also a key financier of the insurgency in Iraq. The Iraqi insurgency consists of two major components: Iraqi Baathists fighting for nationalist reasons and foreign fighters serving Al-Qaeda. From 2003 to 2007, the interests of the two parties converged. So, too, did their reliance on Syrian facilitation. The Baathist element of the insurgency has long enjoyed safe haven in Syria. The Bush administration reportedly presented the Assad government with videotape of Iraqi Baathists dining in a Syrian resort town. Former members of Saddam Hussein's regime have formed a "New Regional Command" that directs and finances the insurgency from Syria. At an April 15, 2004 press conference, Gen. Richard Myers, chairman of the Joint Chiefs of Staff, reported, "There are other foreign fighters. We know for a fact that a lot of them find their way into Iraq through Syria." By the end of 2004, U.S. Defense Intelligence Agency officials concluded that Syria played a larger role in directing the insurgency than they had earlier realized. U.S. troops in Fallujah, for example, found a GPS system in an explosives production facility that showed routes originating in western Syria. The Iraqi defense minister in 2005 said that 400 detainees had trained in Syria. Since 2006, Syria has hosted Misha'an al-Jaburi, a former member of the Iraqi parliament and owner of Az-Zawra'a television, which broadcast pro-Baathist and insurgent propaganda. In one case, Jaburi broadcast songs with secret messages in them for the Islamic Army of Iraq. His nephew provided him with safe houses in which to store weapons and money that was moving in and out of Iraq. While Jaburi was publicly critical of Al-Qaeda, the U.S. Treasury Department has argued that he worked with an Al-Qaeda jihadist umbrella organization, the Mujahideen Shura Council, to fund Sunni extremist operations. Syrian support of terrorism has helped other Al-Qaeda affiliates in Iraq. Ansar al-Islam, an Al-Qaeda-linked group that operated out of northern Iraq, benefited greatly from Syria's lax attitude. Italian court documents show that Ansar operatives traveled to Europe from Iraq and vice versa through Syria. These Syria-based operatives oversaw the flow of terrorists and often made telephone calls to their colleagues in Europe. In a police state such as Syria, such high-level coordination and communication by telephone is unlikely without the authorities' knowledge. Among the operatives overseeing this network in Syria are fugitives linked to the Hamburg Al-Qaeda cell that planned 9/11 and also to a car bomb targeting Israelis in Kenya in November 2002. Italian authorities arrested seven Al-Qaeda operatives that took part in this network after they sent forty terrorists to Iraq via Syria where the Al-Qaeda operatives were to team up with Ansar al-Islam. Perhaps no network was as devastating within the context of the Iraqi insurgency as Zarqawi's. In May 2004, Zarqawi's lieutenants held meetings on Syrian territory to plan a terrorism offensive in Iraq aimed to provoke sectarian violence. On February 23, 2005, Iraqi television aired the confession of a detainee who admitted to "receiving all the instructions from Syrian intelligence" to "cause chaos in Iraq." The detainee, who identified himself as Lt. Anas Ahmad al-Issa, said he was sent to Iraq in 2001 in order to prepare for the day that America would invade. Reuters quoted another group of captured insurgents who said they were being trained in Latakia, Syria, as far back as 2001 in terrorist tactics that included kidnappings and beheadings. Another Iraqi detainee in the videotapes named a range of insurgent groups and said they were Syrian fronts. Ten Iraqis on the tapes said that Syrian intelligence recruited them. Egyptian and Sudanese insurgents also confessed to being trained in Syria. One of Issa's aides said that insurgents were required to send progress reports back to Syria, that they received $1,500 per month, and were supplied with weapons, explosives, and other equipment. The aide said that he was originally recruited in an Iraqi mosque in 2001 and then went to Pakistan for eleven months of training. After that, he traveled to Syria for a month where Syrian intelligence provided training before his dispatch to Iraq. There is little doubt that the foreign fighters network in Syria constitutes a link between the regime and Al-Qaeda. It is impossible for Syria not to know that the networks it sponsors are working with Al-Qaeda. In fact, in April 2005, an admitted supporter of Al-Qaeda was arrested in Iraq as he was planning a car bomb attack. He confessed to his captors that he had links with Syrian intelligence. The Iraqi government said in 2007 that more than half of the foreign fighters arrive in Iraq via Syria. A large number of these fighters fly into the Damascus International Airport. In October 2007, U.S. military forces discovered a stockpile of records in the northern Iraqi town of Sinjar documenting 606 foreign fighters in Iraq. These "Sinjar records" describe how foreign fighters met with Al-Qaeda representatives upon arriving in Syria. Approximately 90 percent of the fighters that arrived in Iraq between 2006 and 2007 arrived via Syria, and these fighters are responsible for 90 percent of the suicide bombings in Iraq. Syria's assistance to the Iraqi Baathist network directly benefits Al-Qaeda. Today, it is virtually impossible to make a distinction between the two forces because of their tight cooperation. Many of these ex-Baathists have joined Al-Qaeda, partially morphing the two forces into one insurgent army. Syria: Ally in the War against Terror? Some diplomats and analysts argue that if Washington engages Damascus, Syria could become a responsible partner in the war on terror. The State Department praised Syria for its cooperation in 2003, but Cofer Black, the department's counterterrorism coordinator, said that public proclamations do not tell the whole story. In 2003, he told Newsweek, "We clearly don't have the full support of the Syrian government on the Al-Qaeda problem. They have allowed Al- Qaeda personnel to come in and virtually settle in Syria with their knowledge and support." Still, the idea that engagement can flip Syria has resonance. After all, intelligence shared by Syria helped thwart a terrorist attack against the U.S. navy in Bahrain. Syrian cooperation, however, was less than complete. The Syrian government refused to give U.S. investigators direct access to Muhammad Zamar which, according to one expert, means it can be "safely assumed that the Syrians did not pass on information that reflected poorly on them in any way." The high profile 2006 Iraq Study Group report, cochaired by former secretary of state James A. Baker III, and Lee H. Hamilton, the vice chairman of the 9/11 Commission, for example, recommended that the United States should "actively engage Iran and Syria in its diplomatic dialogue, without preconditions." The Assad regime has become more adept at public relations. In an attempt to portray itself as a natural ally in the war on terror, the Syrian government has framed itself as an enemy and target of Al-Qaeda. The examples given of Al-Qaeda targeting Syria, however, do not hold up. In April 2004, the Syrian regime accused Al-Qaeda of bombing a vacant U.N. building, an attack for which Al-Qaeda did not claim credit. Timing, however, was suspect since the alleged Al-Qaeda operation occurred just as the U.S. Congress debated placing tougher sanctions on Syria. Syrian officials then refused to allow U.S. investigators to look into the incident. Nor is there any evidence that a September 12, 2006 attack on the U.S. embassy in Damascus was Al-Qaeda's handiwork. Within ninety minutes of the attack, the crime scene was cleared of debris, including the destroyed vehicle, the bodies, and any forensic evidence. If the Syrians believed Al-Qaeda was behind the attack, they failed to allow the examination of any evidence. Proponents of diplomacy base their recommendation on the assumption that the Syrian government has reformed. Practitioners, however, find evidence to support such conclusions lacking. In an October 2008 interview, U.S. Marine Corps Maj. Gen. John Kelly, commander in Anbar province, said, "The Syrians clearly have harbored AQI [Al-Qaeda in Iraq], allowed them to live over there and go back and forth. It's a sanctuary." And "They have done cross-border raids and killed Iraqis. The biggest mistake they made was a cross-border raid on the second of May and murdered 11 Iraqi policemen. They cut their heads off, a sickening thing. It was a huge mistake. We know the guy who did it, AQI guy. Kind of a big dog who works with Syrian intelligence." The Assad regime sponsors terrorism because it is a regime based on terrorism. The advantages for the Assad regime to sponsor jihadists are many. They seek to use terrorists to defeat the United States in the region, thwart the development of democracies in Lebanon and Iraq, and to employ terror as a means of waging war against Israel. Outmatched by the weapons the West possesses, Syria repeatedly turns to unconventional means. Terror sponsorship also creates a dependency upon the Assad regime making it counterproductive for the forces of Islamic extremism to wage war against it. So long as Assad retains a tight grip on Syria, he need not fear these forces turning against him. Finally, the regime sponsors such forces as a tool of diplomacy. By supporting insurgents and terrorists and allowing radical Islam to show its head inside Syria, Assad makes clear that there is no viable alternative to him and that it is he who must be courted if the West is to be successful in the region. Any strategy to tackle Assad's support for terrorism must rely on more than engagement and shuttle diplomacy. The Obama administration should develop ways to make Syrian support of terrorism counterproductive to its own objectives. Rather than allowing terrorism to be an effective tool of diplomacy, such actions must be met with economic sanctions and international pressure. Rather than handing Assad victory in the region, every move by Syria should be countered. The regime must see no gain and only loss from its support of terrorism. Finally, the West should find a third option beyond either reliance on Assad or removing him from power—which would allow the Muslim Brotherhood or other Islamists to take his place. The Obama administration should assist the development of the democratic opposition forces in Syria, however weak they may be. By promoting Syrian democratic forces, Washington will regain a strong hand at the negotiating table, simultaneously decreasing the power of Assad and the Muslim Brotherhood and, most importantly, ending the brutal terrorist regime that threatens innocents both in the Middle East and in the West. Ryan Mauro is the founder of WorldThreats.com and the assistant director of intelligence of The Counter Terrorism Electronic Warfare and Intelligence Centre. Associated Press, Mar. 4, 2009. Claudia Rosett, "Commerce Department Waives Syria Sanctions," Forbes, Feb. 12, 2009. Agence France-Presse, Jan. 20, 2008. "State Sponsors of Terrorism Overview," Country Reports on Terrorism 2007, U.S. Department of State, Apr. 30, 2008. The Guardian (London), Feb. 13, 2008. "President Barack Obama's Inaugural Address," The White House, Jan. 21, 2009. "Homeland Security," "Barack Obama and Joe Biden: The Change We Need," official campaign website, accessed Mar. 23, 2009.
 International Herald Tribune (Paris), May 19, 2005. The Daily Star (Beirut), Oct. 1, 2004. BBC News, Oct. 28, 2002. Author interview with Hamid Mir, May 24, 2006, via e-mail. "Profile: Afghanistan's 'Lion of Panjshir,'" Radio Free Europe/Radio Liberty, Sept. 5, 2006. The Jordan Times (Amman), Apr. 27, 2004. The New York Sun, Oct. 25, 2007; Ar-Ra'y (Amman), June 8, 2007. Ya Lubnan (Beirut), June 5, 2007; Michael Young, "Syria's Useful Idiots," The Wall Street Journal, June 3, 2007. The International Herald Tribune, Mar. 15, 2007. The New York Daily News, June 18, 2007. The Washington Post, June 8, 2005. The New York Sun, Sept. 14, 2007. Thomas E. Ricks, Fiasco (New York: Penguin Press, 2006), p. 409. The New York Times, July 5, 2004. Gary Gambill, "How Significant Is Syria's Role in Iraq?" Terrorism Monitor (Jamestown Foundation, Washington, D.C.), Oct. 7, 2004. The Washington Post, Dec. 17, 2004. "Coalition Provisional Authority Briefing with General Richard Myers, chairman, Joint Chiefs of Staff; Lt. Gen. Ricardo Sanchez, commander, Coalition Ground Forces," Baghdad, Iraq, Apr. 15, 2004. The Washington Post, Dec. 8, 2004. "180 Terrorists Escape to Syria at Start of Operation Steel Curtain," Kuwait News Agency, Nov. 5, 2005. "HP-759: Treasury Designates Individuals, Entity Fueling Iraqi Insurgency," U.S. Department of Treasury, Jan. 9, 2008. Los Angeles Times, Apr. 27, 2003. Los Angeles Times, Apr. 17, 2003. The International Herald Tribune, May 19, 2005. BBC News, Feb. 23, 2005. Associated Press, Feb. 24, 2005; USA Today, Feb. 24, 2005. USA Today, Feb. 24, 2005. Sen. Joseph Lieberman, "Al Qaeda's Travel Agent," The Wall Street Journal, Aug. 20, 2007. The Washington Post, Jan. 21, 2008. Mark Eichenlaub, "Hundreds of Loyalists and Benefactors of Saddam Hussein's Regime Have Been Found Working with or for Al-Qaeda in Iraq," RegimeofTerror.com, July 20, 2007. Matthew Levitt, "Iran and Syria: State Sponsorship in the Age of Terror Networks," lecture presentation, The Washington Institute for Near East Policy, Mar. 7, 2005. The Iraq Study Group Report (Washington, D.C.: U.S. Institute of Peace, 2006), p. 36. BBC News, Apr. 29, 2004. BBC News, Sept. 13, 2006. U.S. News and World Report, Oct. 27, 2008. Related Topics: Syria, Terrorism | Ryan Mauro | Summer 2009 MEQ receive the latest by email: subscribe to the free mef mailing list This text may be reposted or forwarded so long as it is presented as an integral whole with complete and accurate information provided about its author, date, place of publication, and original URL.